Now that the basket weave scarf is done and in the hands of my good friend, I’ve started my next scarf. This one is also for a dear friend who helped me through DH’s illness. This is called Strangling Vine – yeah kinda a creepy name for such a lovely scarf. You can find the pattern here on allbuttonedup.com. 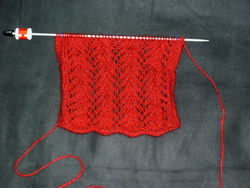 I’m using the same yarn as the basket weave scarf – a mystery red mohair from my stash. Lots of red projects. That’s a pretty lace pattern you chose. Kudos on your green sweater, I’m not surprised someone wanted to steal it! Next: Projects done and new.